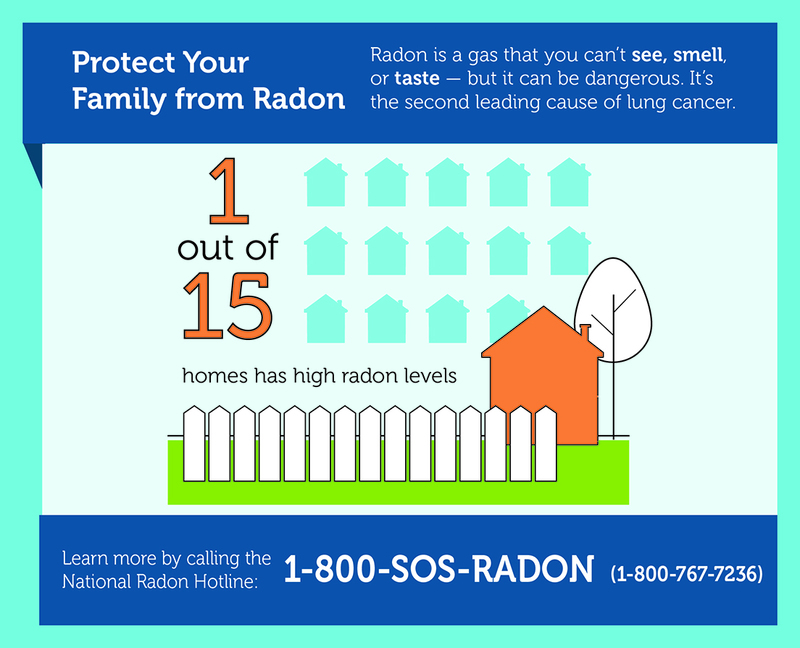 Purpose and use: Use graphics to raise awareness about radon. You can use these graphics in presentations, in documents, or on social media. Suggested alt text: Protect Your Family from Radon. Radon is a gas that you can’t see, smell, or taste – but it can be dangerous. It’s the second leading cause of lung cancer. 1 out of 15 homes have high radon levels. Learn more by calling the National Radon Hotline: 1-800-SOS-RADON. (1-800-767-7236). Suggested alt text: Radon and Smoking: A Dangerous Combination. 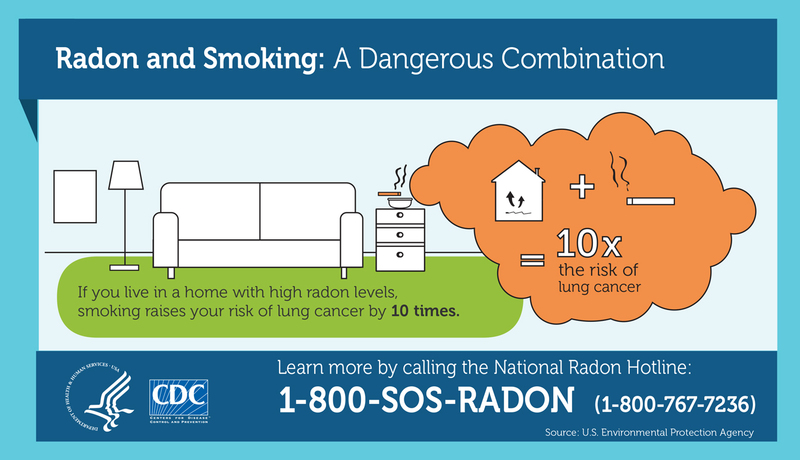 If you live in a home with high radon levels, smoking raises your risk of lung cancer by 10 times. Learn more by calling the National Radon Hotline: 1-800-SOS-RADON. (1-800-767-7236). Suggested alt text: Protect Your Family from Radon. Radon is a gas that you can’t see, smell, or taste – but it can be dangerous. It’s the second leading cause of lung cancer. Radon is in the ground naturally. But sometimes it gets into homes through cracks in the floors or walls. 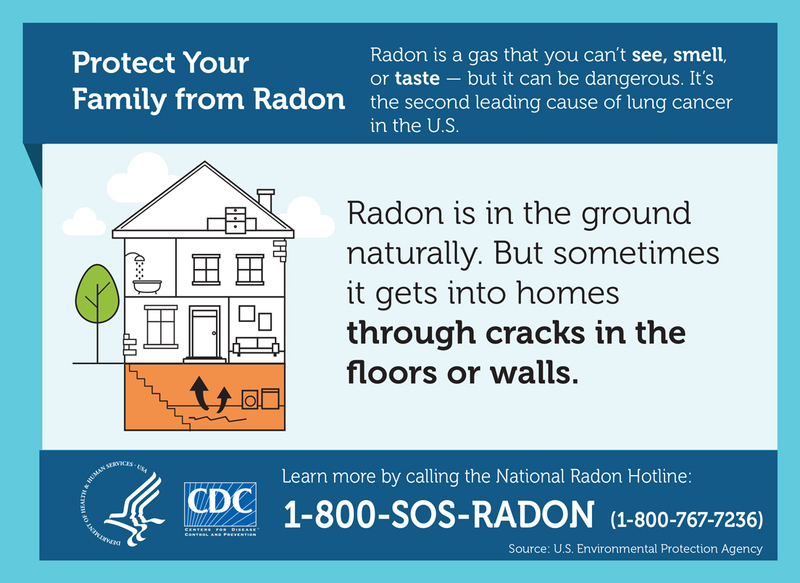 Learn more by calling the National Radon Hotline: 1-800-SOS-RADON. (1-800-767-7236).